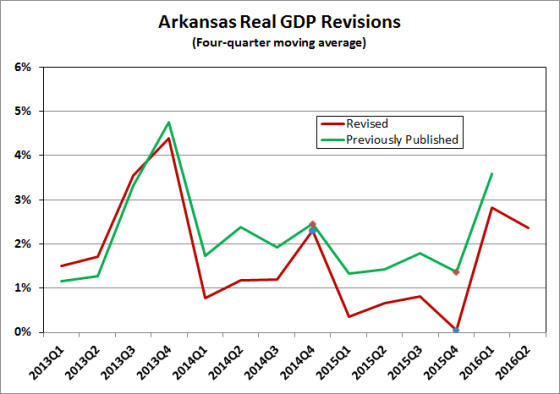 Arkansas GDP increased at a 1.3% annual rate in the first quarter, slightly higher than the nationwide average of 1.2%. Arkansas’ growth rate ranked #23 among the 50 states. The Bureau of Economic Analysis reported that GDP growth was positive in 43 states and the District of Columbia. Growth rates ranged from a high of 3.9% in Texas to a low of -4.0% in Nebraska. 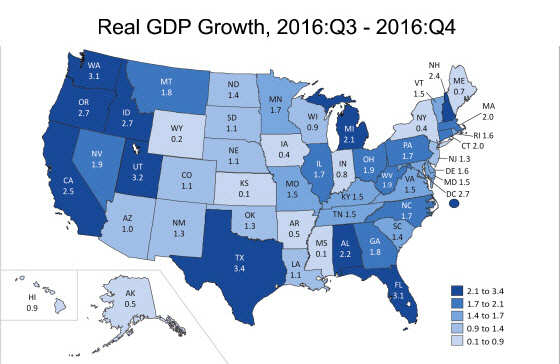 Although Arkansas growth rate in the first quarter was above the national rate, GDP growth had been running below the national average in the second half of 2016. 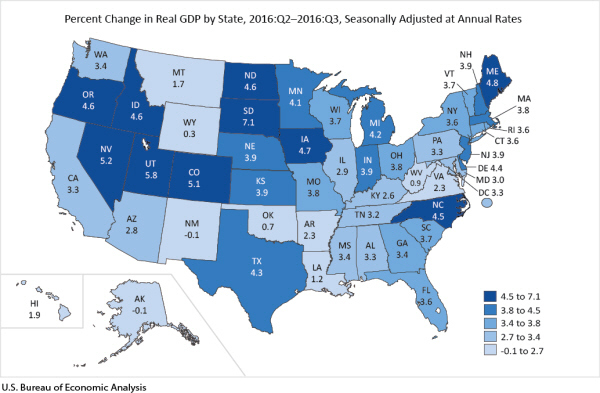 As a result, the latest reading on year-over-year growth shows Arkansas up only 0.3% compared to 2016:Q1, with U.S. GDP up 1.9% over the same period. In its news release, the Bureau of Economic Analysis reported that the nation’s growth rate slowed in the first quarter, with finance and insurance, retail trade, and agriculture, forestry, fishing, and hunting leading the deceleration. 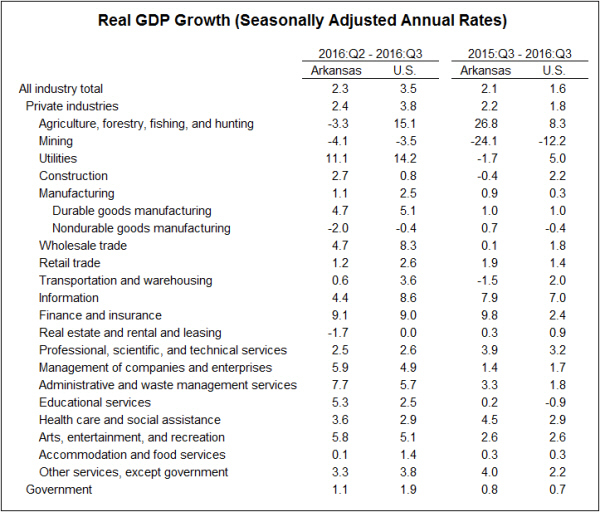 As shown in the table below, Arkansas was an exception to the pattern of slow growth in agriculture, forestry, fishing and hunting. 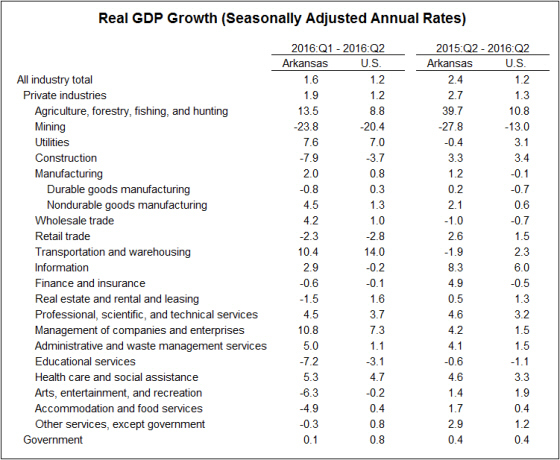 The sector breakdown for Arkansas also showed relatively strong growth in nondurable goods manufacturing. Sectors showing negative growth in the first quarter included retail trade and management of companies and enterprises. The Bureau of Economic Analysis announced this morning that Arkansas real GDP grew at a 2.3% annual rate in the third quarter of 2016. While this growth rate is roughly in line with prevailing trends, Arkansas’ growth lagged behind the nationwide rate of 3.5%, ranking #41 among the 50 states. 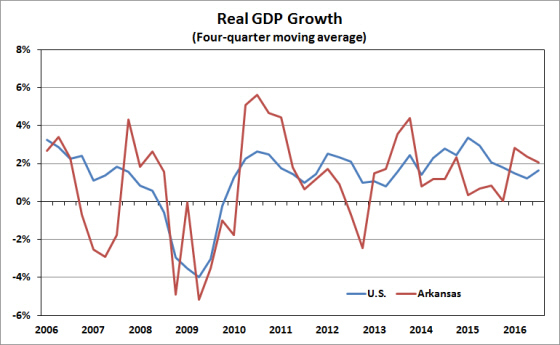 Over the past four quarters, Arkansas’ growth rate has averaged 2.1%, compared to 1.6% for the entire U.S.
As shown in the table below, the patterns of growth rates across sectors are quite similar for Arkansas and the U.S. Growth was relatively strong in Utilities, Finance and Insurance, and Administrative services. Another sector to show encouraging growth was Durable Goods Manufacturing. Arkansas’ agricultural output contracted in the third quarter; however, agricultural output shows substantial volatility from quarter to quarter. Output in the mining sector was down across the board, reflecting continued weakness in oil and gas prices. The Bureau of Economic Analysis announced this morning that Arkansas’ Gross Domestic Product (GDP) increased at a seasonally adjusted annual rate of 1.6% in the second quarter of 2016, following a revised growth rate of 4.4% in the first quarter. 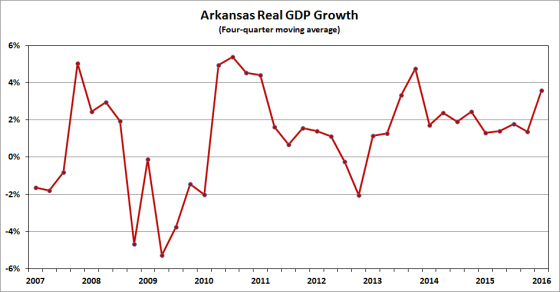 Arkansas growth for the quarter exceeded the national average of 1.2%. 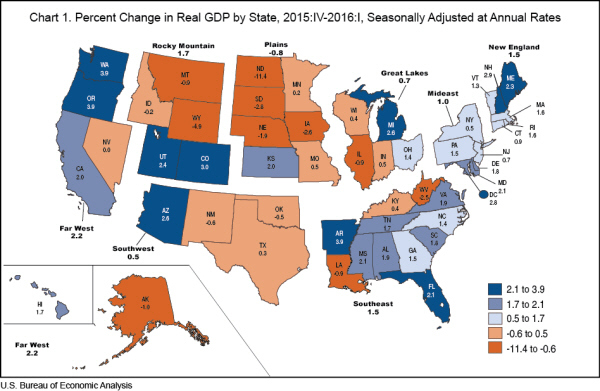 Compared to a year earlier, state GDP was up 2.4%. As was the case in the first quarter, Arkansas’ growth rate was boosted by a substantial increase in the category of Agriculture, forestry, fishing and hunting. Other sectors showing strong growth included Transportation and warehousing, Management of companies and enterprises, and Utilities. Reflecting continued weakness in natural gas prices, output in the mining sector was once again down sharply. Other sectors contracting in the second quarter included Construction; Educational services; and Arts, entertainment, and recreation. Today’s news release also included revisions to previously published data. 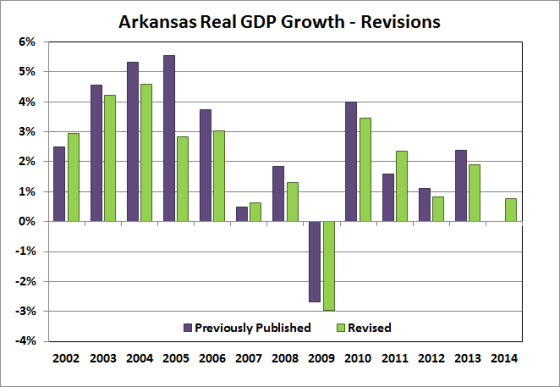 The revised figures show slower growth in Arkansas over the past two years. 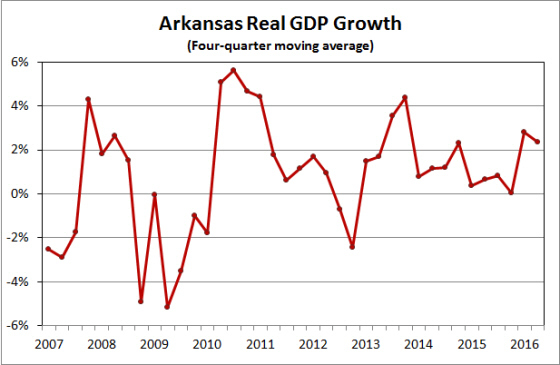 On a fourth-quarter over fourth-quarter basis, Arkansas GDP growth was revised from 2.5% to 2.3% for 2014, and revised from 1.4% to 0.0% for 2015. 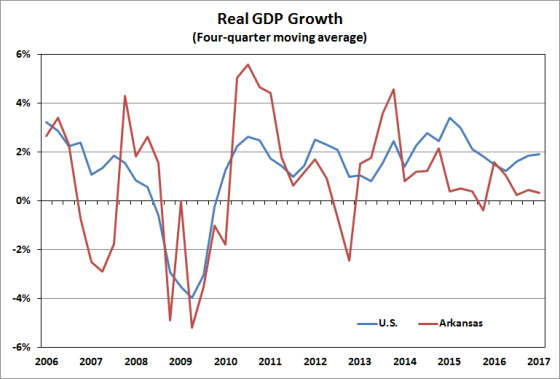 Over the seven year period from the trough of the recession (2009:Q2) through the second quarter of 2016, Arkansas GDP growth has averaged 1.9%. New data on metropolitan area GDP were published by the Bureau of Economic Analysis last week. For the metro areas in Arkansas, the news was decidedly mixed. 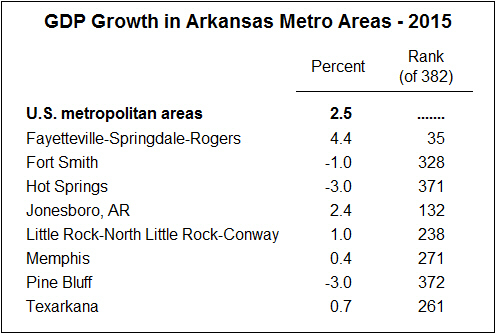 Only one of Arkansas’ metro areas — Fayetteville-Springdale-Rogers — had GDP growth in excess of the national average for metro areas: Growth in Northwest Arkansas was reported at 4.4%, compared to 2.5% for the aggregate of all U.S. metro areas. 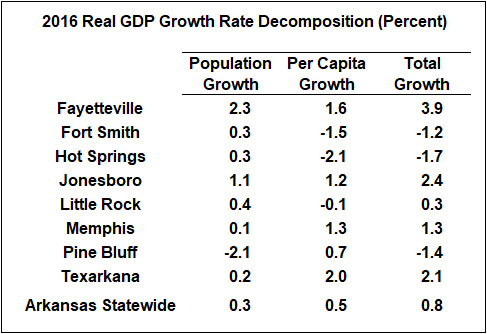 At 2.4%, Jonesboro’s growth rate was near the national average. At the other end of the scale, GDP was reported to have contracted in three metro areas, with losses in Hot Springs and Pine Bluff reported at -3.0%. The data for a single year do not always reveal the underlying growth trend. As shown in the figure below, for example, the contraction in Hot Springs interrupted a series of years with relatively robust growth. Even after declining 3% in 2015, GDP in Hot Springs was up 12.7% from it’s pre-recession level in 2007. Over the same period, Fayetteville was the fastest-growing metro, with cumulative growth of 28.5%. 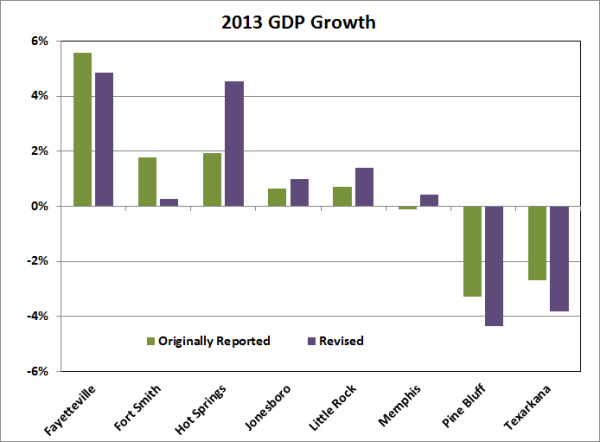 At the other end of the scale, GDP in Pine Bluff was down nearly 14% from its 2007 level. Another caveat to the interpretation of the latest data: The figures for 2015 are considered to be “advance estimates,” subject to considerable future revision. The data release last week included revisions to the data for 2014, which were sizable in some cases. 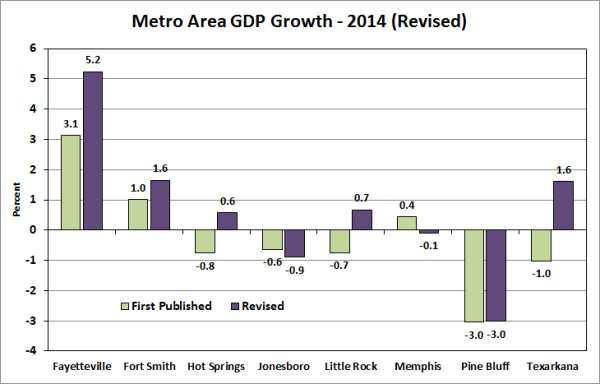 In fact, for four metro areas (Hot Springs, Little Rock, Memphis, and Texarkana) even the direction of GDP change in 2014 has now been revised. The update to Texarkana data is particularly large: having been originally estimated at -1.0%, GDP in 2014 is now reported to have increased at a 1.6% rate. The revisions to 2014 data show that the new data for 2015 should be interpreted with caution. The multi-year trends in the data are revealing, but the latest reading on annual growth rates may look quite a bit different when the data are revised a year from now. 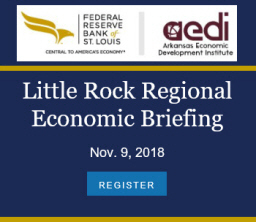 The Bureau of Economic Analysis reported this morning that Arkansas GDP expanded in the first quarter at a 3.9% annual rate — the highest growth rate in the nation. At least in part, today’s report provides additional evidence of a strong Arkansas economy in the first part of 2016. However, the BEA news release pointed out that Arkansas’ growth rate was boosted by an extraordinarily strong growth in the sector of Agriculture, Forestry, Fishing, and Hunting. “This industry contributed 2.21 percentage points to the 3.9 percent growth in Arkansas.” In other words, overall growth would have amounted to only 1.7% had it not been for the contribution of agriculture. 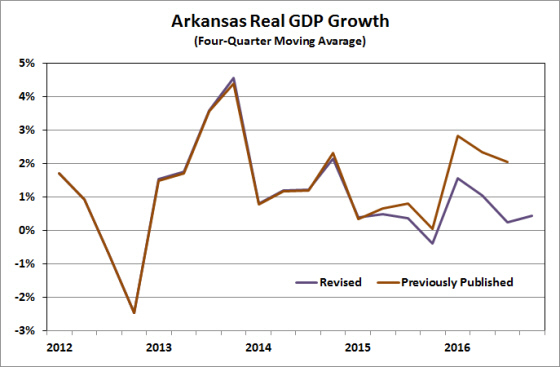 From the first quarter of 2015 to the first quarter of 2016, Arkansas GDP grew by 3.6% — a notable increase from the trend growth rate of approximately 2% that had prevailed in recent quarters. Agriculture was not as significant a factor in the year-over-year growth rate, contributing only 0.6 percentage points to overall growth. So in the absence of agriculture, the state’s GDP growth would still have been 3.0%. 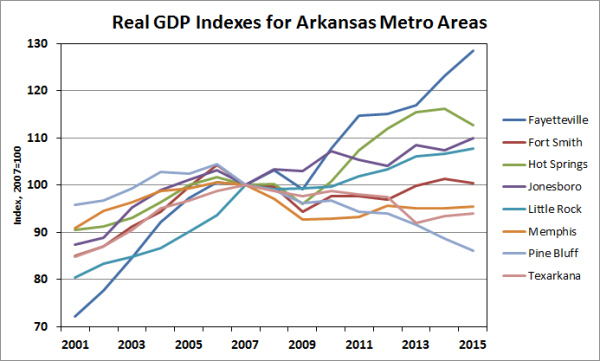 Besides the agricultural component, several sectors contributed to Arkansas GDP growth. In general, the strongest sectors in Arkansas were the same as those driving growth on the national level, including Construction, Retail Trade, Information, and Health Care. Nondurable goods manufacturing also contributed to growth for both the U.S. and Arkansas, while durable goods manufacturing contracted in the first quarter. 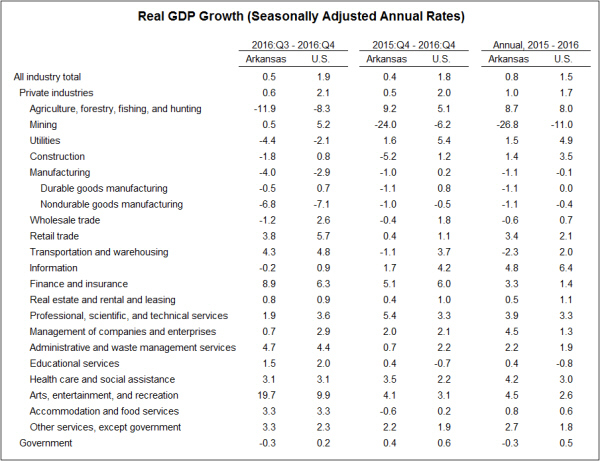 State and regional GDP data for 2014 were released by the Bureau of Economic Analysis this morning. 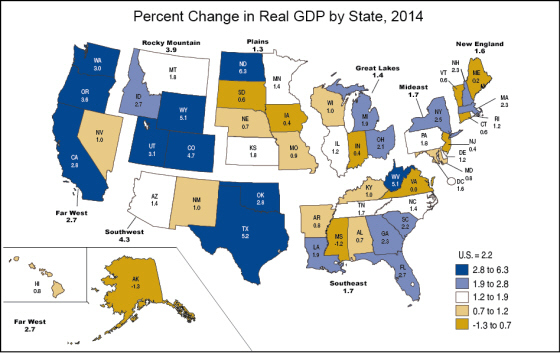 Real GDP growth from 2013 to 2014 was 0.8% for Arkansas, compared to 2.2% nationally. Arkansas ranked 38th among the 50 states in overall growth. 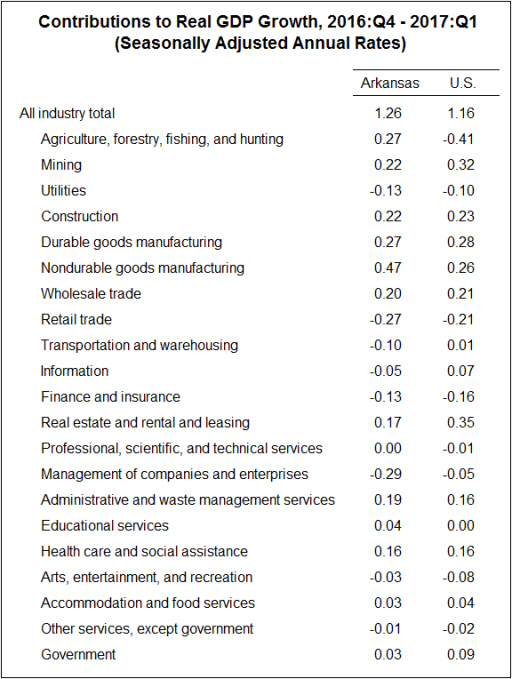 The BEA News Release noted that professional, scientific, and technical services was the largest contributor to U.S. real GDP, and that nondurable goods manufacturing and real estate and rental and leasing were also strong growth components. In Arkansas, professional services and nondurable goods manufacturing contributed positively to growth, but not by as much as the nationwide figures. On the other hand, mining was a strong component of Arkansas’ growth, as was management of companies and enterprises. Week sectors of the Arkansas economy included utilities, construction, real estate, and agriculture, etc. Although the data were not subject to major definitional changes, revisions to underlying source data turned out to be substantial for Arkansas. 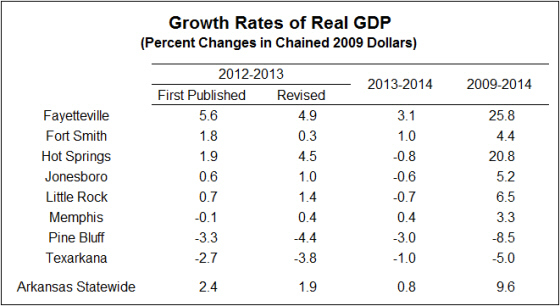 Growth rates over the past decade were generally revised downward, with the exceptions being 2007 and 2011. The magnitude of revisions to previous years’ growth rates serves as a reminder that the new data for 2014 are considered “advance” estimates and will be subject to revision next year. 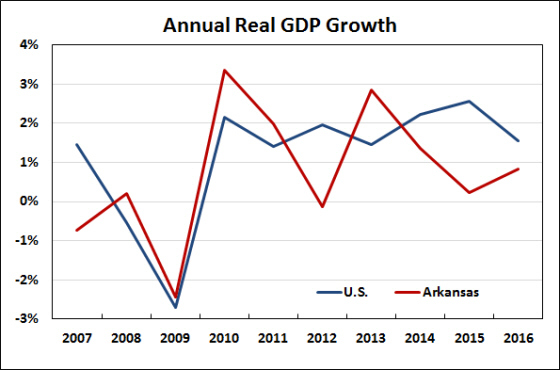 Since the trough of the recession in 2009, real GDP in Arkansas experienced cumulative growth of 9.6%, compared to 10.1% for the U.S. As shown in the following figure, growth in Arkansas was above the national average in 2010 and 2011, but has subsequently lagged behind. New data on GDP growth in metropolitan areas was released this morning by the Bureau of Economic Analysis. The data show robust growth in Northwest Arkansas, but rather sluggish growth in other parts of the state. 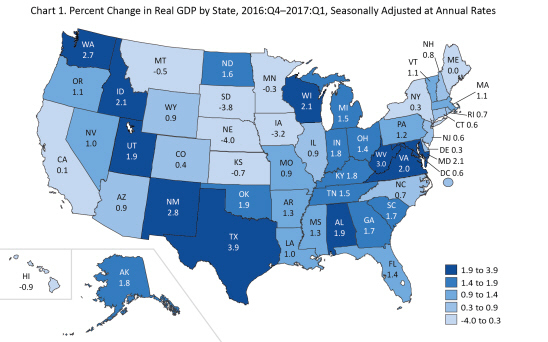 In June, data on real GDP growth by state showed that Arkansas’ economy grew at a rate of 2.4% in 2013, well above the national average of 1.8%. The metro data show that growth to be concentrated in the Fayetteville-Springdale-Rodgers Metropolitan Statistical Area (MSA), which grew at a 5.6% rate. 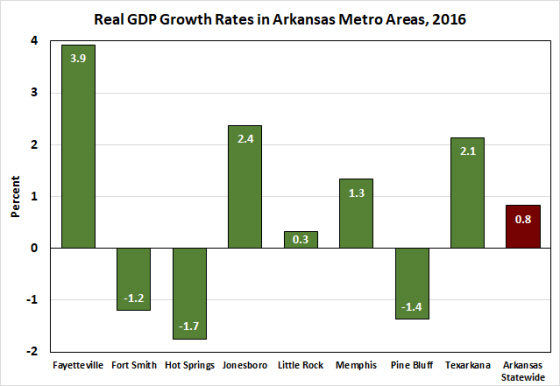 Fort Smith and Hot Springs grew slightly faster than the national average for metropolitan areas, while Jonesboro and Little Rock expanded at growth rates of less than one percent. 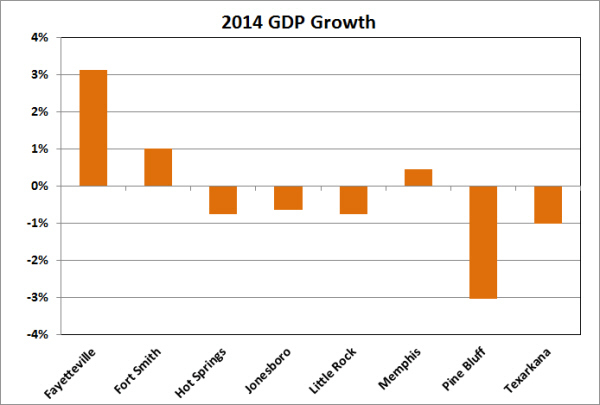 Memphis, Pine Bluff and Texarkana each showed negative growth from 2012 to 2013. Out of the total of 381 MSAs in the United States, only Fayetteville, Fort Smith and Hot Springs ranked above the median growth rate. Although the metro GDP data are based on the best information presently available, the figure for 2013 will be subject to future revision. 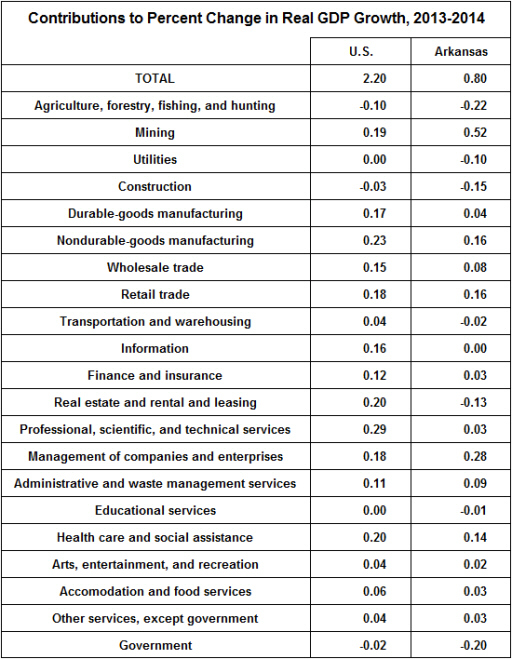 As shown in the table, data for 2011 and 2012 were revised substantially since the last metro GDP report a year ago. Data for Northwest Arkansas were subject to particularly large revisions. Previously published data had shown growth rates of 0.1% and 0.5% in 2011 and 2012. 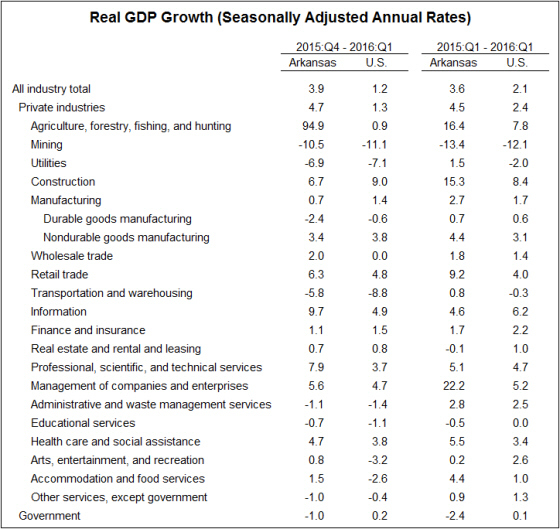 The revised data show growth rates of 4.4% and 1.9%. At the other end of the scale, growth rates for Texarkana were revised downward rather sharply. The new data also report on GDP per capita, which might be considered a better indicator of economic performance (because it accounts for differences in population growth). Statewide, GDP per capita in 2013 was $39,111 in 2013 (inflation-adjusted 2009 dollars) — amounting to 79.6% of the national average. 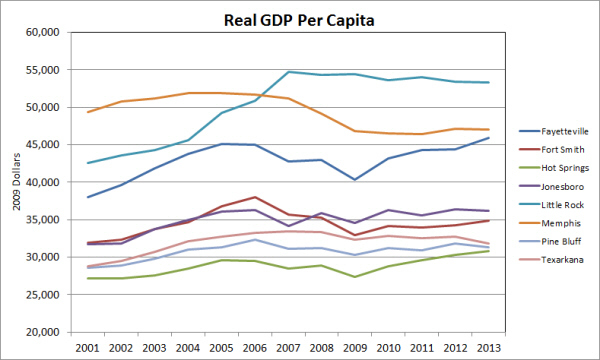 As shown in the chart below, there are some significant differences in GDP per capita among the state’s metro areas. 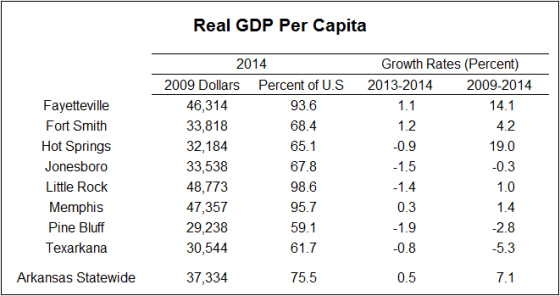 Little Rock is the only metro area with GDP per capita exceeding the national average in 2013 (102%). Memphis and Fayetteville stood at 90% and 80% of the national average, respectively. The lowest per capita GDP was for Hot Springs: the 2013 figure of $34,918 amounts to only 59 percent of the national average GDP per capita. 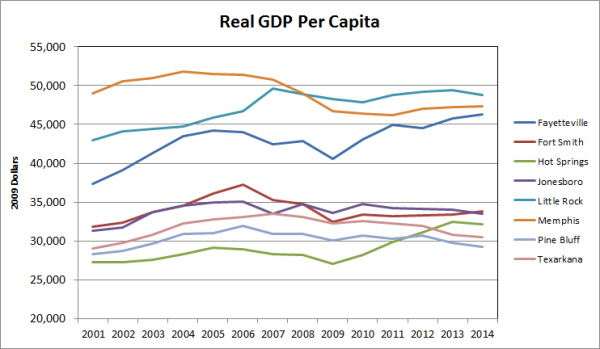 Since the recession trough in 2009, real GDP per capita has increased substantially in Fayetteville (+13.8%) and Hot Springs (+12.3%). 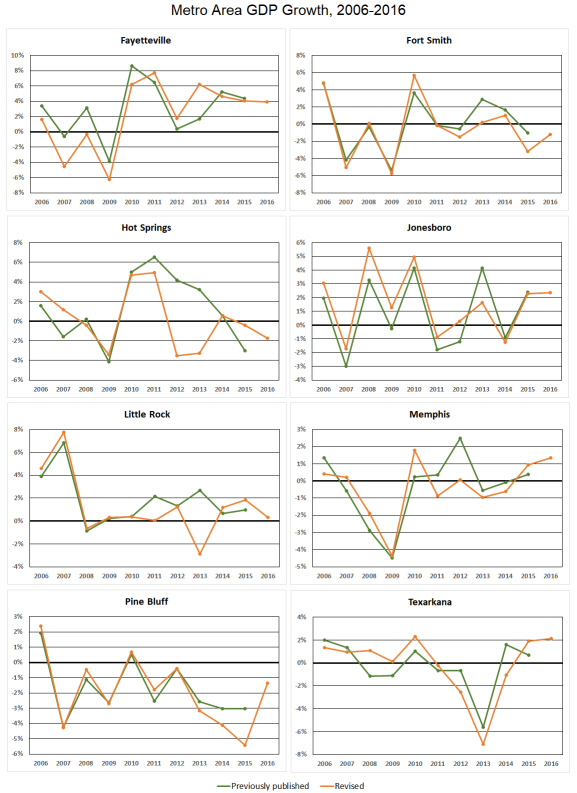 It has increased more slowly in Fort Smith (+6.0%), Jonesboro (+4.7%), Pine Bluff (+3.5%) and Memphis (+0.4%). 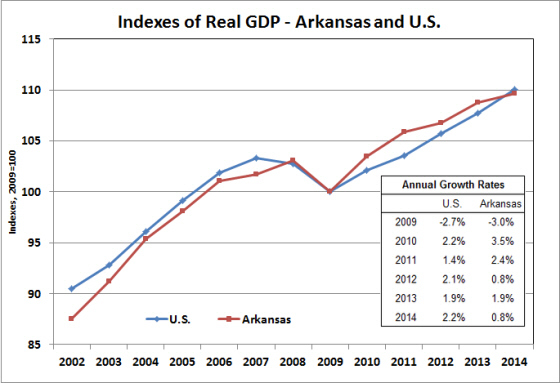 Little Rock and Texarkana have seen negative growth in real GDP per capita since 2009 (-2.0% and -1.5%, respectively).